For our final homage to all foody things great about Lancashire I wanted to use potted shrimps and make a potato cake, and here it is! 1. Peel and chop the spuds, boil with the garlic cloves and allow to cool a little. 2. Mash the potato with a big knob of butter and season. 3. Mix self raising flour into the mash to make a dough, roughly 4 parts spud to 1 part flour. 4. Pat lumps of dough into cakes about 1/2" thick, leave them roughly shaped for rustic or trim up into squares or triangles for posh. 5. Heat some oil in a frying pan and medium heat and turn the oven on low. Fry the cakes in the pan, turning occasionally, then put them in the oven to keep warm. 6. Shred the cabbage and stir fry in a wok with lemon zest, at the end squeeze in the juice of the lemon and season. 7. At the same time as cooking the cabbage, dry the bass on kitchen roll, score the skin at 1" intervals, season, then place skinside down in the frying pan used for the cakes on medium heat. You must press the fish down gently as it curls, it will only curl for a minute or so. Fry skinside for about 3-4 minutes then flip over fry the flesh for 1 minute. 8. 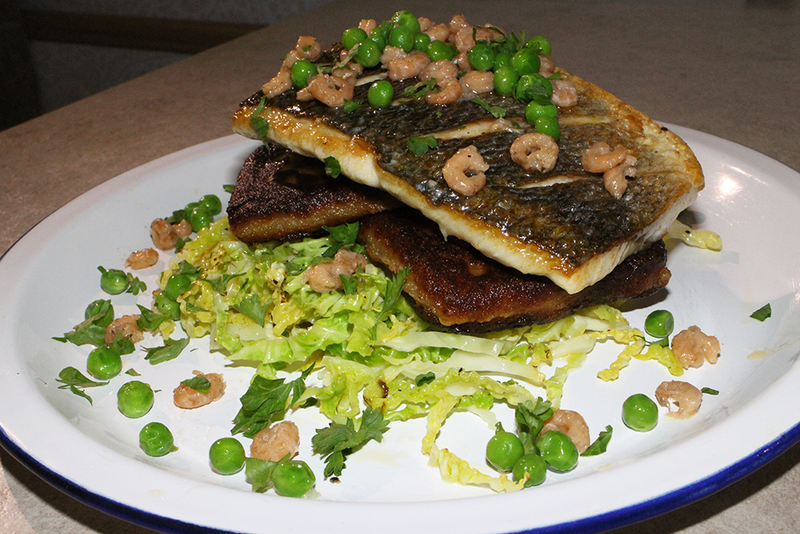 Remove the fish from the pan and bung in a handful of peas for a minute. 9. Put the pot of shrimps in the microwave for about 20 seconds or until the lid rises. 10. Plate up and pour over the lovely buttery shrimps. I gave mine a sprinkle with Lancashire Sauce too, yum! Upon reflection it would probably of been easier to buy ready made potato cakes from Booths. I'll probably make this at home with rosti's. You could even use potato waffles!